Okay, I’m just going to be honest with you. I’ve been sitting here trying to write this blog post for the last twenty minutes or so. The things I typed out onto the page are suspicious at best. There was this whole bit about a Sailor appearing out of nowhere and taking us to Margaritaville. A boozy nautical kidnapping if you will. There was an entire paragraph where I described what this margarita would be wearing if it were a super hero. For some reason it had a sombrero made of limes. There were tights. There was a cape. His super powers included staining your clothes and getting you drunk. I don’t even know anymore. This week has been a doozy. Somewhere between starting this post and the last string of deleted sailor and superhero metaphors, my spirited Golden Retriever managed to find her first mud pit of the season. She usually never comes inside when I want her to, but of course, today, with pride in her eyes and paws full of mud, she charged me. She ran puppy laps around the couch. There were expletives. There were paw prints. There was me, on my knees, scrubbing a carpet and carefully removing chunks of earth from it’s fibers. There was a guilty puppy face. There will be a Friday night steam cleaning party. Bartender, I’m going to need a margarita. 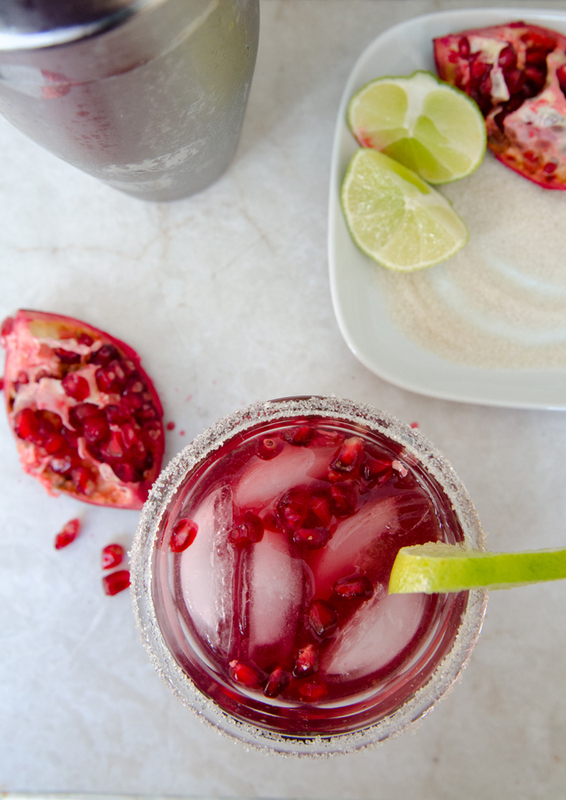 We’re going to start talking about margaritas right after we look at this photo and draw the conclusion that cutting into a pomegranate bears visual similarities to the aftermath of Dexter’s kill room. Did you guys watch that show? What did you think of the finale? I can’t even talk about it. I mean… just… no. I LOVE a margarita. And I’m talking a real deal marg, not that premixed super sugary bull-roar you can buy at a drug store (yes, I purchased margaritas at a CVS in my college days–don’t judge me). We’re talking the kind loaded with fresh lime and real deal booze, no added sugar and a perfectly salted rim. Just thinking about them takes me back to my Honeymoon in Mexico. Laying on the beach, motionless. Drinking enough tequila to kill any leftover wedding stress plus a few extra brain cells. Getting my picture taken with a disgruntled cross-eyed monkey. Good times. But, it’s not beach season, and as much as I respect your right to drink whatever the heck you want, whenever the heck you want it, it’s always nice to have a signature seasonal cocktail. It never hurts if that cocktail is both delicious and photogenic. Imagine yourself holding one of these in the photos from your next holiday get together. The red from the pomegranate juice, complementing that smart looking outfit you’ve got on. 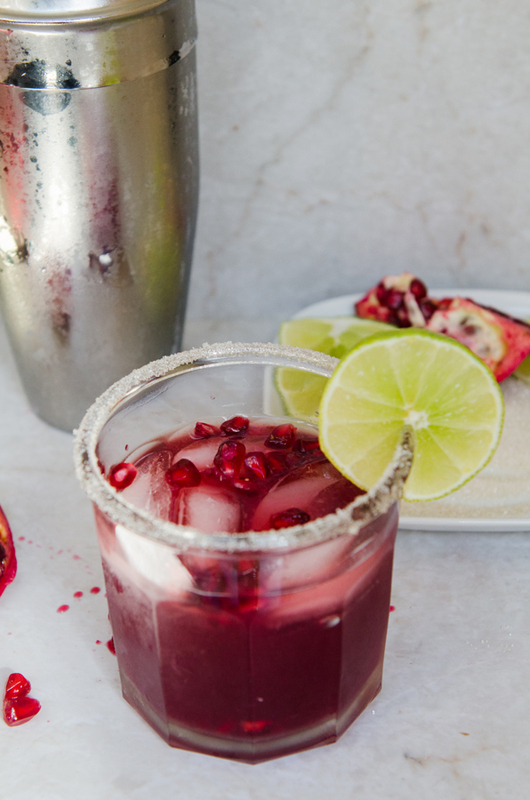 The lime wedge and the pomegranate seeds adding a certain flare that screams “Yes, I have a holiday Pinterest board, and I’m not afraid to use it.” You’re a good host. I like you. Let’s get our pictures taken while holding these margaritas. Pretty pomegranate seeds float inside like teeny tiny rubies (am I the only one who imagines I am a super rich giant eating tiny rubies when I eat pomegranate seeds? 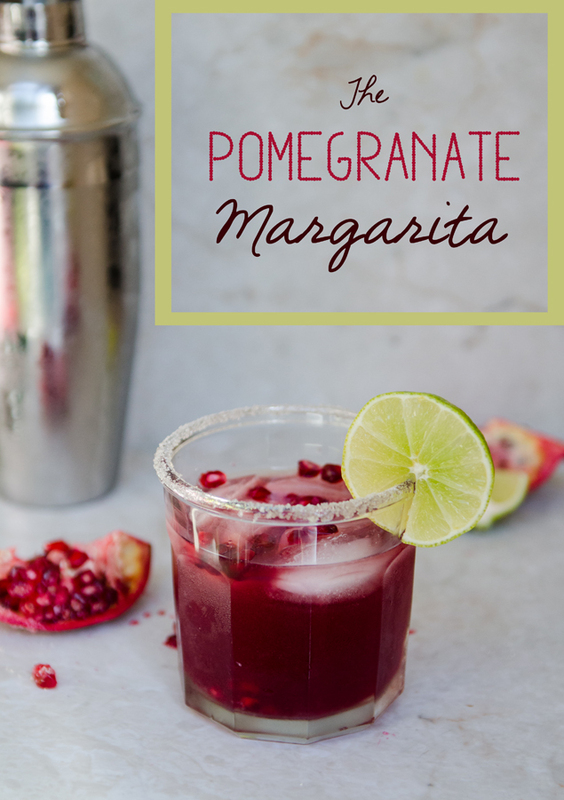 Don’t leave a girl hangin’) and the pomegranate juice is both sweet and tart which makes it the perfect addition to a margarita. Oh, but I will warn you… these things are strong. I recipe tested this for you at noon on a Wednesday. It was delicious, so I finished the whole thing. Whoa. So, in short… it works. Really, really well. Using a lime wedge, moisten the lip of your glass. Pour some sugar out onto a small plate and dip the rim of your glass into the sugar. This should sugar your rim. Add a few ice cubes to your glass and set aside. 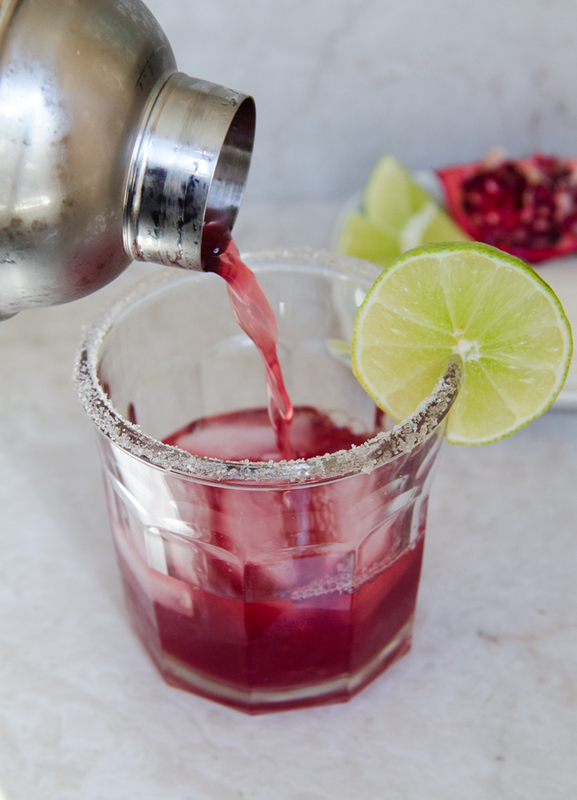 In a shaker filled with ice, add in your tequila, pomegranate juice, triple sec and lime juice. Shake vigorously. Pour your drink into your glass with the sugared rim. 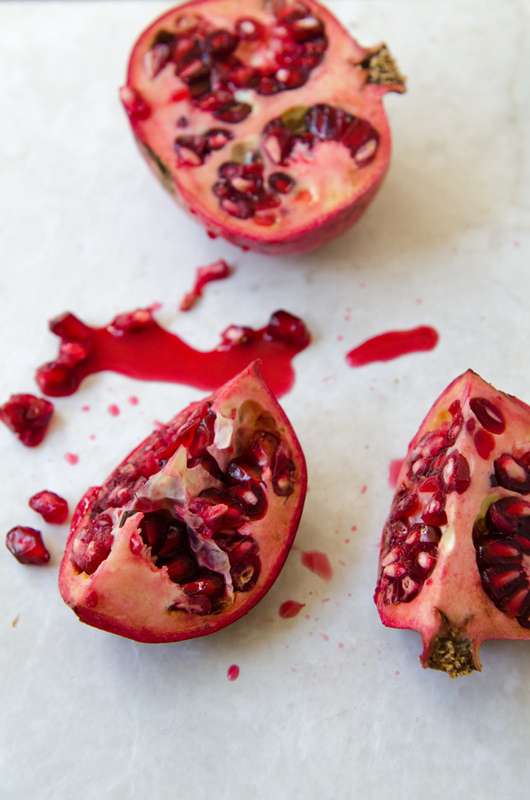 Add in your pomegranate seeds and stir. Now THAT is my kind of margarita. Gorgeous!